College Basketball Scoreboard, now available on Windows Phone Marketplace, gives fans up to the minute scores, schedules and news throughout the NCAA Tournament. College Basketball Scoreboard, the top college basketball app on iPhone and Android, is now available on Windows Phone. 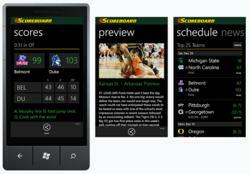 Just in time for the basketball tournament, Smartphones Technologies announced the release of its College Basketball Scoreboard app for Windows Phone, available for download now from the Windows Phone Marketplace at http://bit.ly/AfaRpt. College Basketball Scoreboard gives fans up to the minute scores, schedules, and news for all FBS and FCS Conferences, including live scores throughout the NCAA Tournament. Fans can customize the app to view their favorite conferences, or view Top 25 teams. New in the Windows Phone app is a “games today” feature, giving fans instant scores for all games in progress. Other new features include tapping on a game to follow the score for just one game, or viewing the app in light or dark themes. Fans can also pin the app’s Live Tile to their start screen, where it shows “Live” when college basketball games are in progress. College Basketball Scoreboard lets sports fans quickly and easily find the scores, schedules, and news they care about. “We’re excited to launch on Windows Phone,” said Mike Merrill, Founder and CEO of Smartphones Technologies. “Windows Phone is a fantastic platform for developers, and we expect it to be a great new revenue opportunity.” Smartphones Technologies also plans to publish its College SuperFans and College Football Scoreboard apps on Windows Phone Marketplace in the near future. College sports generated over $6.2 billion in revenue in 2011. According to Kantar Media, advertising revenue in the 2011 NCAA Tournament was an all-time high of $738 million, up 20% from the previous year. CNBC estimates that fans bet $2.5 billion in bets on the tournament, and an estimated 60 million people will create brackets. Smartphones Technologies, Inc. is the publisher of College Football Scoreboard and College Basketball Scoreboard, the top college football and basketball apps on both iPhone and Android. Smartphones developed College Basketball Bracket Challenge, and College SuperFans apps for more than 80 colleges and universities. Smartphones also builds apps, widgets and live wallpapers for leading brands like the NFL, MAXIM and The Twilight Saga: Breaking Dawn. Smartphones is based in Jacksonville, FL and is privately held.